PeaZip is a feature-rich file archiver with broad support for 100+ archive types. The file manager interface includes a hash tool, file wipe, file associations, themes, estimated compression level, system benchmark, image crop/rename and much more. Note that tools setup through the task scheduler are not portable. Formats supported include most mainstream archive formats, including 7ZIP, ACE (read), BZIP2, CAB, GZIP, MSI (extr. ), RAR (extr. ), TAR, UPX, ZIP, as well as it's own PEA format. Cross platform (Linux/BSD) and a 64-bit version is available. Alternatively, PeaZip Portable portablizes bookmarks and includes both 32 and 64-bit versions, automatically using the proper one on each PC. How to extract: Download the "portable" ZIP package and extract to a folder of your choice. Launch peazip.exe. Download link (http://www.peazip.org/peazip-portable.html) raises a 404 "not found" error. Link instead just to http://www.peazip.org/ or to http://peazip.sourceforge.net/peazip-portable.html. PDFTK Builder is a tool to combine (collate), split, decrypt, add background/stamp, password protect and other security features. It is a graphical user interface (front-end) to the command-line PDFtk. Note: double-click on "Document Protection" for available security features. Alternatively, PDFTK Builder Portable is a PortableApps version of the program. Optionally, update PDFtk to the latest version (download the installer and extract pdftk.exe and libiconv2.dll to the application folder). Bugfix: Minor collating page range bug. pdftk Builder 3.6 will not break with pdftk 1.44 in my use of it. However, I would really love to use multibackground and multistamp (the main visible additions to 1.4. which Builder 3.6 was built upon). I still haven't found a gui for Windows that takes this into account, so I am using batch files for this specific purpose. PDFTK Builder works in Windows 7 x64 and Windows 8.1 x64 too. 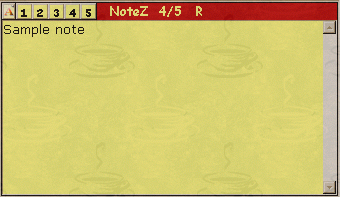 NoteZ is a virtual Post-It sticky pad that resides in the system tray. It supports always-on-top, transparency and keyboard shortcuts. How to extract: Download the ZIP package and extract to a folder of your choice. Launch NoteZ.exe. DriveZ is a utility that lists folder tree contents and puts them into the clipboard. It supports file name mask and extension removal. How to extract: Download the ZIP package and extract to a folder of your choice. Launch DriveZ.exe. 1. Somehow or the other I wasn't able to find this entry on TFPC. I searched for "DriveZ" or "drivez" (without the quotes) and found nada, zero, zilch. Maybe I'm missing something but I'm out of ideas. I only happened to come across this TFPC listing while I was searching for DriveZ on the Internet. 2. Both the website and download links you have above redirects to Softpedia and I get "ERROR: 410 Gone". Obviously, Softpedia (for whatever reasons of their own) has de-listed this program. 3. The current home page for this software is http://www.inet.hr/~dragvola/index.html and NOT the one in the accountant's post above. P.S. I don't know why the ENTIRE URL above isn't shown as hyperlink. 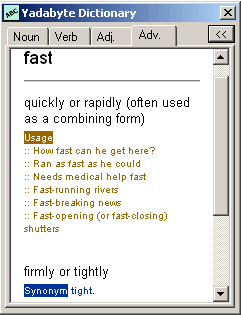 Yadabyte Dictionary provides a small and fast American English dictionary that contains more than 145,000 definitions and synonyms. It uses state-of-the-art compression to squeeze nearly 24MB worth of information into a mere 5MB. How to extract: Download the ZIP package and extract to a folder of your choice. Launch YadabyteDictionary.exe. This is brilliant. Love it. This program is really good and if you like it you'll love 'TheSage Dictionary'.